Inspired by the mention of cutaway drawings and cutaway drawing artists in the fairly recent Ford Cosworth SCA thread, I find it timely that a TNF thread is dedicated to this wonderful amalgamation of art and technology and the artists that have provided us racing car enthusiasts so much technical insight and aesthetic pleasure over the years. The cutaway drawing perhaps did more than anything to kindle my interest in the technical side of motoring in general and racing in particular – informative and so pleasing to look at. I’m sure other TNF’ers may recognize that sentiment. For decades it seemed to me that the cutaway drawing was such an integral aspect of news, information and data concerning all things motoring in general, and racing cars in particular. There was a time when one could count on a number of cutaway drawings in numerous motor sports related publications to keep one occupied over the off-season – they don’t seem anywhere near as frequent anymore, though Giorgio Piola is still very active. I wonder why that is: Is it due to the current and increasing secrecy/paranoia resulting from corporate involvement and megabudgets in all levels of racing, the artists of a lost art dying off and not being replaced, or is it because publishers believe that current corporate customers and us enthusiasts will accept nothing less than a fully rendered 3D computer graphic model? Thoughts, gentlemen? My personal favourite is Tony Matthews, who appears still to be active, providing one finds the right publications. In particular, I find that his colour renderings are without peer – simply superb. Never the most detailed, but incredibly crisp and tangible with almost mathematical precision. For monochrome linework, the late, great Jim Allington was the Master – the amount of detail he could include was staggering, and he was an expert in combining cutaway and ghosting techniques. He seems to have inspired the equally impressive David Kimble, who does seem to go somewhat overboard on detail occasionally, IMO. I’ve already mentioned Piola – I wonder if Italians Rosso and the Bettis are still alive and active – all very good at colour work, as were the French Bellus – are they still around? Others that I can think of OTTOMH are Brian Hatton, Theo Page, Bill Bennett – there were more good ones in Autocar, Motor, MotorSport and Autosport that I can’t recall off-hand. Lots of lovely line-and-wash work. Then there is, and were, the more artistic technical renderings – not so much cutaways – of Werner Bührer and Bob Freeman. I’m sure others can add to the list – perhaps with information on what publications the various artists were and are active in then and now! dave kimball is still quite active but seems to have struck some kind of deal with gm..corvette in particular...i think there was a thread on automotive illustrations that mentioned the talented gentleman that did all the line drawings for the early porsche manuals..to that end i have recently been pouring over ferrari 308 parts books and realized that someone had to hand draw all those exploded views..the same with austin and triumph literature...no cad systems then! !..i'm sure that there are thousands of unnamed artists whose work we have taken for granted over the years that will never be identified...as i recall there was an urban=automotive myth that allington took a lotus elite in exchange for services rendered [sorry] with mr chapman. I'm actually surprised that David Kimble was active as early as 1965 - he must be a lot older than I thought, then. The earliest Tony Matthews work I've seen is from 1971, which would, I suspect, indicate that Matthews is in his sixties and that we'll fortunately still be able to see a lot more from his gifted hands. I wonder if the German illustrator you're referring to could be either of the very prolific "S.W" or Schlenzig? Their line illustrations seem to be virtually everywhere in German automotive litterature in the 1950s and 60s. I've done a few exploded view drawings manually in my career - they are very time-consuming to do do, but doesn't a hand made drawing look just great compared to the CAD ditto? The manually executed drawing allows more scope for varying line weights and trim, making the rendering more 'tangible'. Having said that, the quality of modern computer renderings and the capability of the software is truly impressive, and for better or for worse it does enable people who can't really draw or paint make some impressive illustrations. Technically, the only drawback of the 3D CAD solid rendering is that you need a comprehensive and coherent 3D model of what you're illustrating, which means that subjects made prior to the advent of 3D CAD need to be fully modelled before they're illustrated that way. When done manually, you only need to draw the wanted view, which for a very complex subject may be a lot quicker after all - but then again you only get that one view. You may have seen the cutaway I've done of a DeTomaso Pantera Gr.4 in another thread - although far from flawless, it took about 150 hours, whereas a full 3D CAD model complete with plumbing etc. would have taken considerably longer - just digitizing and measuring would have taken ages. So for some purposes, the manually prepared illustration is still difficult to replace - but not on a new product where everything is 3D CAD-modelled anyway. BTW, I'm very impressed by those 3D car renderings used in some computer games - they are sort of a combination of the manual and the CAD method and seem to make the best of both worlds. I think my favourite artist is still Betti and all his renderings with side/front and rear views. 200 cutaways of everything racing. Although I now work as a motor sport artist, my training came from technical illustration. I had always painted and drawn scenes of racing cars from a very early age, it was Michael Turner and Autosport's Theo Page who inspired me. After college in the late 70s/early 80s, I worked in the German car industry. All over Germany, in contract drawing offices were British Technical Illustrators - the best in the world - earning three times the market rate in the UK with unlimited hours. We would regularly get off the plane, straight to work and do a 2 week 14 hour day, 2 weeks on, 10 days off. It was amazing how many Brits there were, in design, styling and other departments. Fitting in race meetings in the time off with family life was the hardest challenge! When I came back to work in the UK in around 88, I worked for one of my former colleagues who had set up his own office. One of the clients was Lola, being nearby. We did many exploded drawings, mainly of the suspension components, all by hand in those days. For example the T88 F1 car, F3000 etc. Another nice project to work on was the maintenance and parts manuals for the Hewland LD200 gearbox. This was designed with the then new Formula Forward in mind, which didn't really take off, however the box was used in many other FF cars etc. I did a full cut-away drawing of it, using an actual casing plus design blueprints for reference. I also produced exploded drawings of the internals with annotations, part numbers etc etc. With most racing cars types being a short manufacturing run, often each model modified there is no point in the expense of an illustration for the assembly proceedure. Tony Matthews once told me it was getting harder and harder to gain access to the actual cars or the drawings for reference due to the secrecy in contemporary racing car manufacture. I did go back to Germany for a while, and trained on computer graphics. Somehow it does not hold the same appeal to me, I prefer the pencil, pen or brush but it is still amazing what the modern computer programmes and operators can achieve. Unfortunately the days of producing tech illustrations by hand are long dead, as are the opportunities for technical illustrators. A designer can now 'turn', his blueprint at an angle on the PC screen, render it in colour and even animate it, cutting out the need for an illustrator to provide a 3D image of his design. I'll dig out the Hewland cutaway and one of the Lola ones if interested and post them here. We would certainly be remiss in this thread not to mention Yoshihiro Inomoto and Gordon Bruce who produced wonderful ghosted drawings. you say IF interested ???? why haven't you posted them YET ???? There's an interesting parallel to the aerospace industry (my main field) in that it, too, was, and is, staffed to a very large extent by British design and engineering contractors doing silly-hour shifts away from home, anywhere in the World where there's an aerospace company. I've worked with quite a few of them - and with such a large contingent there are both the brilliant and the less so. I don't know how the British travelling contractor tradition came about - the British ones seem more mobile than most - I suppose it may have been instigated by the decimation of the British aircraft industry in the 1970s with the attendant aly-offs. Why is it that Britain produced more and better technical illustrators than other countries? Again, I suspect the requirements of the British aircraft companies may have been a factor, but other countries would basically have had the same requirements. Thoughts? I suspect that your LD 200 illustrations are the ones that can be found on the Hewland Engineering website - they're absolutely excellent. I also wonder if some of the exploded views of Lola suspensions in the Starkey book are yours - or was that before your time? Technical illustration - an art like so many others dying the computer death. Still, there's now the computer rendering specialists instead, but IMO the real artists now in that domain are the anonymous 'nerds' who write the remarkable modelling and illustration software. But being The Olde Farte I am, I still prefer the feel of the hand-made technical illustration, yet I must concede the 'war' is lost for good. Please do post some of your technical illustrations, Andrew! There's an interesting parallel to the aerospace industry (my main field) in that it, too, was, and is, staffed to a very large extent by British design and engineering contractors doing silly-hour shifts away from home , anywhere in the World where there's an aerospace company. Back in 1967 Shell oil sold or gave away very nice prints of James Allington's Chaparral 2F, Ferrari P4 and Ford Mk IV. By some miracle I managed to retain mine in fairly decent shape over the years, and they now hang framed in my office, where I marvel at them everyday. Interestingly, Allington shows no hint of the original Chaparral 2 chassis countour behind the rectangular sill profile of the 2F, and I wonder he was aware that they were the same car when he did the drawing. Although he didn't do cutawys, I always looked forward to the drawings of Werner Burher, which appeared periodically in Road and Track, especially those which illustrated features of the latest Formula One cars. Piola's drawings remind me of Burher's in many ways, although they are much more refined and detailed, and his annual books on Formula One are extremely impressive. There is a book out recently which might interst some of you. Its called "Graphic War, The Secret Aviation Drawings and Illustrations of World War II" by Donald Nijboer, and it contains many examples of cutaway and other artwork from training manuals, posters, etc. produced by the major powers in WWII. About half the examples shown are (surprise) British, with the rest about evenly divided among American, German and Soviet. For whatever reason ther are no Italian or Japanese examples included. A similar book on the history of race car cutaways would be very welcome. A couple of years ago I got a bunch of Ferrari cutaway drawings from a friend. Thing is they´re not signed so I have no idea who the artist is. Here´s an example. I also have a book called "Formula 1" from 1976...illustrated by Herbert Müdsam...who I believe works/worked for Volvo. In that book he has drawn among others a cutaway of the "tea-tray" MARCH 711. This thread brought back memories of one of the earliest racing posters I ever owned. It was a cutaway of a '72 Parnelli Indy car (the one with the weird dihedral wings). If memory serves, I picked it up that year at a shopping mall in San Jose, where reigning USAC champion - and local hero - Joe Leonard's Parnelli was on display. The artist was Japanese, but his name escapes me. I was leafing through the August '68 issue of Road & Track this past week and came across a Shell ad featuring the Chaparral 2F that Steve Sobieralski mentioned. The set of three Allington prints was available from Shell for the princely sum of one U.S. dollar. On my office walls today are Ford Mk IV and McLaren M8A cutaway prints rendered by Mati Palk, as well as five Werner Bührer prints. All were available from R&T back in the late '60s/early '70s, though I bought these NOS examples off eBay a few years ago. On my shelf is a book called "Inside 100 Great Cars." It's a collection of double-page (and some three-panel foldout) cutaways and ghosted illos, of road and racing cars dating from the De Dion Bouton up through the mid-1980s Corvette and T-Bird. The subjects seem to have been selected at random, but the volume includes a range of artists including Allington, Tony Matthews, Martin Donovan, John Lawson, Roy Haynes and many others. Staffan: Judging from the style and subject matter, I'd guess your 512S was done by Tony Matthews. Rex Burnett worked a few years at Hot Rod Magazine. He seems to have started doing the cutaway drawings of hot rods, etc., in the first year (1948) of the magazine. He could have started earlier somewhere else. Not sure how long he did it but I've seen a 1951 cutaway he did of a rear-engined sprint car built by Victoria, BC's, Jack Smith that was mistakenly identified as a "track roadster". The question is how accurate would the drawing have been? Did Rex travel the 2,000 miles from California to Canada in 1951 or did he work from photos and descriptions? Just wondering. You'll soon have another cutaway to add to the book. I posted the McRae drawing a few days ago. That is a Betti and was published in the Italian mag "Quattroruote"
We only got to go outside when it was dark. Other favorites of me include also Cavara and G. Gedo. Does anyone have more info on them? Here are a few examples of my work, although I have not found any of the old Lola examples yet. This first example is very basic, one of the projects we were given to do as students. I studied at the Isle of Ely college in Wisbech Cambridgeshire from 1977-80, which at the time was regarded as one of the best Technical Graphics courses in the country. Our tutors had a background in aircraft illustration, having worked at Rolls-Royce, De Havilland, Vickers etc. In the classroom was this old BMC engine which we had to strip down, then measure, sketch each component and produce the pencil exploded drawing, to a size of approximately 30ins high. Usually a technical illustration would be drawn onto a perspective grid. The final ink drawing was done on draughting film, tracing the pencil lines but with Rotring ink pens, differing nib thicknesses for the line weights. The numbered annotations were done with 'letraset' which were sheets of letters and numbers like a transfer, they could be put in position and rubbed down, a bit like transfer logos for a model kit. The internal components were done as a seperate second illustration, but sadly I have no idea where my copy of this went. 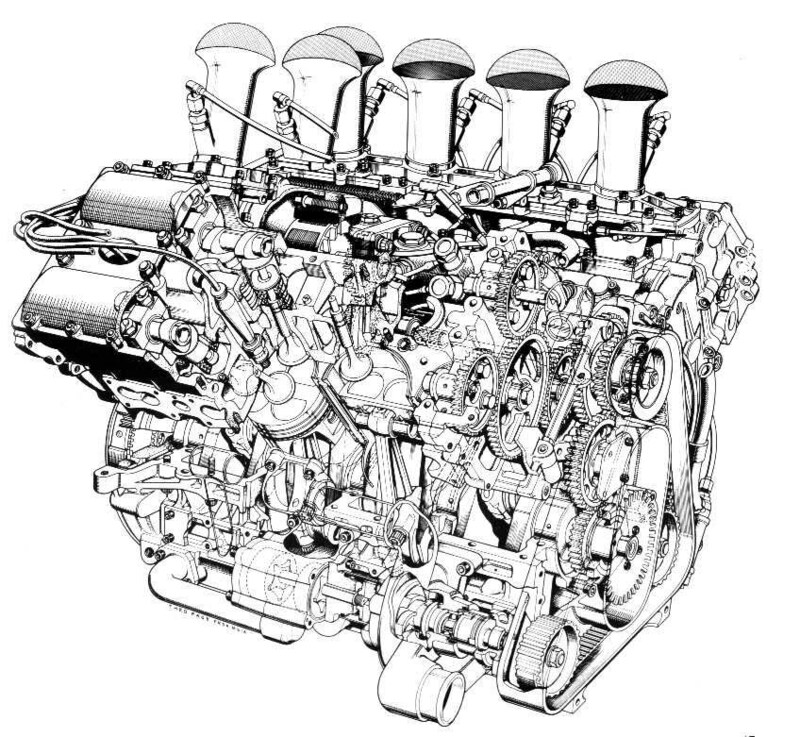 The Hewland LD200 cutaway illustration was done in 1988. I went to Hewland, collected the casing and blueprints from the Hewland engineer looking after this project. He was Mark Bailey, who now runs his own racing team MBR in the ARP F3 series and has also built his own sportscars in the past. The pencil drawing was created the same way, although the information was more exact with detailed blueprints to work and measure from. The greatest skill the technical illustrator has to master is to visualise a 2D technical drawing / blueprint as a 3D image, especially in an assembly and ensure that each component is drawn in the correct position, to scale and in the correct assembly sequence (if producing an exploded drawing). Again the pencil drawing was traced over, using Rotring pens. A photographic copy was then made (a bromide) which gave dense black lines on perfect white photo paper. After annotations were added to the bromide, the line illustration was then ready for printing. A second bromide was to be coloured, for use in a Hewland presentation. The colour was added using pantone colour film. Sheets of pantone came in many hundreds of different colours. The coloured sheet would be laid over the ink bromide and was slightly transparent, so that the ink lines were visible. With a sharp scalpel, the area to be coloured could be carefully cut out following the lines, the colour peeled off the pantone sheet and stuck down on the illustration. Now with computer graphics letraset and pantone film are obsolete! I did train to use computers to illustrate and mastered the art, although as I said, being old school I have always preferred the 'by hand' way. This illustration of a KKK truck turbocharger was done in 1995. However it is a mix of new and old. I produced a pencil drawing, in the traditional old style as mentioned, using blueprints ( print outs of CAD drawings). The pencil drawing was then scanned and this scan was used as the basis and as a background on the Apple MacIntosh screen for me to render it. You might be thinking I used the programme Adobe Photoshop to colour it, I certainly would now if doing the same again. However ten years ago the other Adobe programme 'Illustrator' was a far better option. Another example of the 'by hand' way is this study of this Vincent I did in 1983. I think it is a 'black shadow', someone will no doubt correct me, have forgotten! It was done completely from photographs and measurements, for a series of prints published by Ensign Publications. Again a pencil drawing was produced, the inked on draughting film. The stippled effect on the seat was just that, hundreds of tiny dots using a 0.2mm thin pen to create the effect. I'll have another look for the Lola drawings. Hope you like them! Gedo, from Gédovius, his real name, died at a great age some years ago. Before WW2 he worked mainly for l'Actualité Automobile and Speed. After the war we could find his drawings in l'Action Automobile et Touristique, Moteurs, L'Automobile and L'Equipe. My preferred cutaways from him: Delahaye 145-V12, Bugatti 59/50B 1938, Alfa B, Maserati 8CM, Mercedes W154 1938, Auto-Union D-typ. If somebody is interested by some scans let me known your e-mail addresses. Tony Matthews did one of the McRae GM1 f5000 car for motoring news. Graham said that he was only in the workshop for a morning, and the result was fabulous. I have a copy, but once again the copywrite issue arises. I used to copy the drawings myself in days when I had more time on my hands, I remember free hand copying a Lotus 72 and a Tyrell (P34 or oo1 I don't remember. I guess they would have been motoring news or Motorsport) It taught me a lot about how things worked and why. I also did some very similar (but not as good) ink drawings of motorcycles that look just like the Vincent above. My old man had a Vincent just the same as that, apparently the crancase finish is the give away as to whether its a black shadow .....black crank case means black shadow if I remember correctly. My favourite peices of cut away art are of the BRM V16, where clear layers of plastic have cutaways on both sides. When all the layers are there the engine is complete, when you get to the last layer it is is laid bare in the minutest detail. A truly fabulous example of the art. My guess is that today magazines just won't pay the rate for decent pieces of art work when a staff photographer can fill the same space. I have often seen drawings like that in old magazines and technical manuals and taken them for granted. I now realise that a drawing like that must take many hours to produce! Thanks very much chaps. Some of the most complicated illustrations I did were when working in Germany, particularly illustrations for VW or Opel. Apart from parts and bodywork illustrations of the cars, we did an awful lot on the tooling and production lines. Illustrations from a basic general assembly drawing of a welding line, visiting the site to take photos and make sketches/notes to work from. If any of you have seen inside a modern car production line, the robots, platforms, safety fences, pipes and cables, control panels etc etc, it looks very complicated and congested. The difficult part is knowing what is relevant to include in the drawing and what to leave out! Plus the fact there was often a jobsworth not happy with a camera belonging to an outside agency being in the plant, so having to rely only on sketches instead and often when the line was in operation! In the 80s there were 68,000 workers at VW Wolfsburg - a huge plant 10km long. Quite impressive that the steel goes in one end and 24 hours later the completed car is ready for despatch. I never ceased to be amazed how many robots and how much infrastructure is needed just to make something such as a door or chassis component. The illustrations I did were mainly for planning meetings. If a robot needed recalibrating, or put into another position or another section in the production process adding, it was far easier for the engineers in the meeting to look at a large perspective drawing overview of the line on the wall to discuss, rather than hundreds of blueprints or standing on the factory floor. A drawing as described like this could take 300-400 hours without the gathering of info at the plant. Just a further note on the comment about English contract engineers. If design time by hours was how you measured the country of origin for a particular car, the Mazda MX5 would be British, as would most Porsche and Audi products. Same with Daewoo and many hundreds of other cars. British contract engineers float around the world making an extremely good living. I want to mention Saab's house technical artist Rony Lutz here as well. The German has been working for Saab since 1972. I have appreciated his work ever since. Tony Matthews is my favourate cut away artist especially the colour drawings in Race Tech and Racecar Engineering magazines his work has also be published in many books. The last time I enquired about him I was informed that he has taken up carpentry! Poor Tony Matthews found that it was becoming simply impossible to make a living out of his motor racing cutaway artistry, the moreso since manufacturers are even obstructive to technical photography nowadays, never mind intrusive artistry of the level attained by Jim Allington, and in which he then tutored Tony. Consequently, the latter took up house property restoration instead and the last time we spoke he told me that his hands are now so "knackered" from mixing cement and wielding picks, bricks, saws, drills and hammers all day that he frankly doubts he still has the physical capability to produce the fine artistry of his - to me - brilliant past. For anyone really interested in the skill of the cutaway artist per se, as opposed to those more confined to racing car subjects, there is a SUPERB book of aeronautical cutaways from the pages of 'Flight' and 'The Aeroplane' celebrating the artistry of Max Millar, Vic Berris, Michael Badrocke and many more, while Cyril Posthumus also did a coople of books I believe - one on GP cars, one on sports-racers, majoring on cutaways from 'Autocar', 'Motor' and other previously published sources. Very sadly, this seems to be a dead art these days - simply priced out of existence; but to me it reached its absolute pinnacle in the work of Allington, Matthews and Inomoto. I've seen this book, and it is indeed stunning. In fact, airplane cutaways are one of the reasons I got interested in technical things and trying to actually understand how things went together. It carried over into my interest in cars as well (I have a series of three big books about WW2 aircraft, divided into American, British, and German aircraft-they're collections of some sort. But they have lots of beautiful color painted illustrations, and some wonderful cutaways of the more significant aircraft, by someone named Weal. They're three of my favorite research books). Anthony Pritchard's recent book Sports Racing Cars features lots of cutaways, all of which are wonderful, and certainly added to my understanding. Andrew, I'd like to add my compliments-your illustrations are great! I particularly like the Vincent 'bike drawing-that'd make a wonderful print! The book with aerospace cutaways Doug is referring to could be "Under The Skin" published some years ago by Flight International. IIRC, Max Millar also did numerous, lovely ink-and-wash cutaways of motorcycle engines in particular - and OTTOMH it was he who did the cutaway of the very first Cooper 500 - the pivotal amalgamation of car and motorcycle. It saddens me deeply that a master such as Matthews cannot find cutaway-work within motor racing anymore - something is definitely wrong with the way of the World if that is the case. Although I'm sure Matthews excels at whatever he does, I find his current predicament such a waste of talent. Doug, how old is Tony Matthews, BTW? And is there any chance of disclosing his whereabouts? - I'd love to send him a letter - well - fan mail of a sorts. It's a real shame if the art of the racing car cutaway is reduced to the occasional hiccup by fumbling amtateurs such as myself - but at least I did manage to get a commission for this cutaway drawing of the DeTomaso - albeit at an embarrasingly low price (or perhaps as befits the quality or otherwise of the drawing). http://forums.autosp...y=&pagenumber=2 post no. 129, if anyone can be bothered. Your illustrations are absolutely stunning - thanks for sharing! You must've had the talent before you began your formal training and career. And, IMO, your drawings are much more pleasing to the eye than any near-real-life 3D CAD rendering, however impressive they are. (I must be a dinosaur). Nothing to shame yourself about Anders. Me oh my what talents we have among us !!!! Doug, does Tony still live in Hitchin? Give him my regards please next time you speak to him. A brilliant illustrator. Much of his colour work people took for granted as being airbrush. It was infact a perfect graduated fine wash using brushes. His handling of the impression of the carbon fibre 'weave' was absolutely brilliant. Such a shame he could not make a living. As Doug said the paranoia in the motor industry with a camera around is a major hurdle. I guess the only opportunities are illustrations of older cars with known technology and components. But who will pay as an illustration such as one of Tony's, take it from me, involves many weeks hard work! It is always the fine detail that is time consuming. "... but to me it reached its absolute pinnacle in the work of Allington, Matthews and Inomoto." I just would add two Italian talents to your top list: genial B. Nestola -mentor of Piola- and "maestro" Bruno Betti. BTW: Who have surpassed the elegance of Max Millar, S. Werner or C.O. La Tourette? And please don't forget Cresswell and Theo Page! Another to add to the list is C.O. LaTourette. CLT drew most of the cutaway drawings for Sports Cars Illustrated from the inception of the magazine until ~1961. Sports Cars Illustrated became Car and Driver in 1961. CLT's work was not as detailed as that of James A. Allington, but CLT was extremely prolific and created cutaway drawings of many of the prominent cars of the period. Just a list of the cutaway artists I have works of in my collection. I will have to check for a lot more which haven’t been filed yet. And this is just Motor Sports I am speaking of………if I check my aviation library……..
my collection to share with you. this is my first post on the forum I am the same Eric that took those old shots of the Connew back at Bra... no, I can't say the name of the circuit that was the nemesis of the car [hello Barry!]. As this is, to me at least, a classic I would have thought it was available to buy. Can anybody please tell me if Autosport have an outlet for prints from their artists or if this is available from anywhere? Theo must have built up a body of work as he would be the one name that I could remember for this type of drawing. Thank you for looking, as they say on Ebay. Eric seing your new around here i guess you could use the ...Introduce yourself! thread so we can get to know another OssieTNFer. I haven't got any copies of my racing stuff anymore but have a few of engines. I also like your extremely crisp linework exploded views, with the subtly differentiated line weights. Very pleasing on the eye. Are you sure you don't have any racing stuff you can show us? Just why is the colour red used to indicate the cut, is it linked to the colour of blood and the analogy of cutting flesh? I always use a colour that stands out and is possibly the opposite to the actual material. If you cut a piece of steel the section would be a silvery colour, much like everything around it. Using red makes the cutaway obvious and shows the shape. If the product was red, I would use a different colour. Red has been used historically, certainly as far back as I can remember from museum visits, etc. I understand the reason and this is no big deal, just a question out of curiosity. My particular line of work has it's own colour coding when reviewing drawings mark-ups and highlighting are red - to be incoporated; blue - to be deleted; yellow - OK, etc. Unfortunately a lot of stuff was lost when I moved home (my mother accidently threw them away). I do have a tank though! Are you still on talking terms with your Mother, though? Just out of curiousity, what racing car-related cutaways had you done?